It is a pleasure to welcome Dan Gheesling to Jake’s Take. Dan first became a household name when he entered the Big Brother house during the CBS Reality TV competition’s tenth season. Throughout his first season, he won three Heads of Households (HOH) and two Veto competitions. He was also the first and (currently only) houseguest to win the series with a perfect jury vote (7-0). Four seasons later, the Big Brother production team invited him for a chance to return to the game. At first, he served as an advisory coach alongside legendary Big Brother players Britney Haynes, Mike “Boogie” Malin, and Janelle Pierzina. However, he re-entered the game as a player when he, Britney, and Janelle pressed the “Reset” button. While he lost to Ian Terry in a 6-1 jury vote, Dan not only won an HOH, a Veto competition, and $20,000 during Season 14, but it also cemented his status among the Big Brother fan base as one of the greatest houseguests of all-time! Once Dan left the Big Brother house for the second time, he developed an online following on Twitch and YouTube as he showcased his passion for video games. He recently tackled a plethora of action-packed games including Dark Souls II: Scholar of the First Sin, Escape from Tarkov, and NBA 2K19. In this edition of A Conversation, Dan talked about the professional challenges that he faced leaving the Big Brother house, which two Big Brother 20 houseguests he thinks might appear on future seasons, and previewed his new podcast: The Dan Gheesling Podcast. Jacob Elyachar: Recently, you celebrated the tenth anniversary of your first appearance on Big Brother. How have grown as a person since your first appearance on the CBS Reality TV competition? Dan Gheesling: That is a great question. You are talking about ten years of growth. I just look back at that time and so much has changed for me on a personal level. I’m married and have two little boys at home. But, I think individually what’s changed for me is that I think I have matured a lot as a person in some ways. I don’t feel ten years older; I feel like I’m mature in different regards. But, I still feel like a little kid when I do things that I get fired up about. I think from an outside perspective; I’ve been able to step away from Big Brother and appreciate it a lot more because I’m not as wrapped up in it as I used to be. Jacob Elyachar: You had the opportunity to appear on two seasons of Big Brother. What were the most significant similarities and differences between your two seasons? Dan Gheesling: The first time I played it, I would say it was a lot less taxing and maybe a little bit more fun because you could play without any presumptions. No one knew who you were and what you’re capable. It was the first time I was trying to figure things out and just trying to survive week to week. So, I’d say the first time was a lot more fun, a lot less taxing, and the second time around was way more. I don’t want to use the word “stressful” because it’s not really stressful, but I never really turned my brain off the second time around, and there was a lot less downtime where you can relax and have fun. I wouldn’t let myself do that because I just knew I had a much bigger target on my back the second time around. Jacob Elyachar: Big Brother 20 concluded on Wednesday, Sept. 26 with Kaycee Clark winning over Tyler Crispen in a 5 to 4 jury vote. What were your thoughts on this overall season? In your humble opinion, do you see anyone from the Season 20 houseguests in a future season or a hypothetical second Big Brother: All-Stars season? Dan Gheesling: I think it’s widely known and talked about that this season has been really good and I think the main reason why, especially in the early weeks, it wasn’t a one-sided affair. There was a lot of uncertainty, and I feel like people like to tune in and have an incentive to watch Big Brother live because they don’t know what’s going to happen. I think a lot of weeks, especially in the early side of this season, there was a lot of uncertainty, so that generates people getting excited about the show and that’s what I like to watch. It’s not always that intriguing to watch when it’s an 8-to-0, and you know, what’s going to happen five days prior. So, I think that definitely contributed to it. Also, there were not too many massive twists. Season 20 was one of the lighter twist seasons that we have seen in a long time. I think that’s made it more enjoyable because the viewers had the opportunity to see people play a little bit more. I don’t want to say it was an authentic game, that’s not the right word, but they could play without a fear of something drastic happening. I think the other thing that was good that there were no returning players. Anytime, you have a returning player inside the house, they could take away from other players, and it’s not always fun to watch, which I think made for a great season this time around regarding people I think you could see back. I think a lot of people are going to want to see Tyler come back and play again. He played really hard and especially the way the jury votes shook out. I think you would play maybe a little bit differently and I could see him continuing to evolve his game because he seemed to be a really big fan. Also, I think the long shot that could come back for another season would be Angela (Rummans). I think she was a great female villain and it seems like it is rare that we get those types of players. But, regarding who won this show, I think it’s been a while since we’ve had two people at the end who played really hard. They just played in two different ways. So, I think whether you agreed with the ending or not, I think it was a good season from beginning to end. 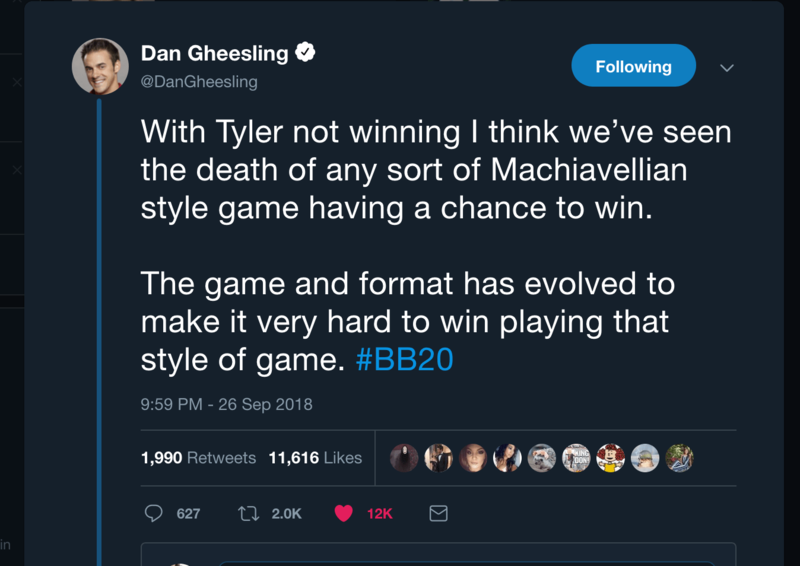 Jacob Elyachar: On Sept. 26, you tweeted: “With Tyler not winning I think we’ve seen the death of any sort of Machiavellian style game having a chance to win. The game and format have evolved to make it very hard to win playing that style of game.” Do you think the show’s fan base would be disappointed if this type of gameplay fades away? Why or why not? Dan Gheesling: I do not think that it is going to go away. I just think over the past few seasons the audience has seen how extremely difficult it is playing to win with that style of game. I don’t think it’s impossible, I just think it’s very unlikely, and if you were asking me how to play the game in modern Big Brother, I wouldn’t recommend playing that way because it’s not rewarded in the end. That’s the only thing that matters is “Did you win the show?” We have seen it over the past couple of seasons, people that play in a way that isn’t super nice or unless if they don’t bring someone with them to the end that is either despised or didn’t do anything in the game. There’s no chance they are going to win because they are sitting up against a middle of the road player or even someone that didn’t ruffle any feathers. It’s going to be really difficult to beat that person playing that sort of game in the modern Big Brother era. While I don’t think it’s going to go away, I just don’t think you are going to be able to see many people pull it off and when playing that style from here on out. Jacob Elyachar: What were some of the professional challenges that you faced once you got outside of the Big Brother house? How did you overcome those obstacles? Dan Gheesling: It is really interesting when you come off of a Reality TV show, whether it’s a first or second time, there are some internal pressures. One of them is that you have this pseudo notoriety, which is so unique. For me, one of the things that I did not want to be that I wanted to try and find a way to leverage that was unauthentic. And I think it’s taken me many years to figure out. I have done things such as college speaking, and I’m glad to have that opportunity. I’m fortunate that I have this exposure and in a lot of people that have been supportive of me since I’ve been on TV, but I just knew that I did not want to talk about Big Brother for the next ten years of my life. We all have goals and challenges, and I guess the best metaphor I can give is that Big Brother was like a mountain. It was a mountain I always wanted to climb as a kid, and I feel like I have scaled that mountain, and rarely do you see people climb Mount Everest twice. I am not saying that in a self-aggrandizing way, but it took me a while to find what was the next thing I wanted to do. I am very fortunate to have found it, and I have been really working on developing a gaming YouTube channel and broadcasting three times a week on Twitch. I have been pursuing this for the past six years. I just feel fortunate that I have found it and I have some creative outlet that I’m able to pursue. Jacob Elyachar: I’m so glad that you brought up both your Twitch and YouTube channels because that is what I admire about you. There are not a lot of people who competed on Big Brother that were able to successfully transition their time in the house and launch their respective career in the media industry. That is what I admire what you, Derrick (Levasseur), Jeff (Schroeder), and Jessie (Godderz) have done as all of you transitioned into the next chapter of your professional careers. Dan Gheesling: I think it’s interesting you bring that up because the transition to go from Big Brother into the media industry. I think it takes a couple of things for that transition to be successful. One, you have to be really self-aware of what it is exactly what you want to do. Just because you go on TV, there is no guarantee that people are going to continue to enjoy anything you do outside of Big Brother and I realized that, it is not easy to make that transition, and it’s an uphill battle. I can remember very early on when I started to go on Twitch back in 2012, people asked me: “Why aren’t you talking about Big Brother?” and “Why don’t you live stream about Big Brother?” I did not want to be not appreciative to the people who came to check out my content, but at the same time, I do not want to about only Big Brother for the next 20 years. Jacob Elyachar: What are some of your favorite video games that you played on your Twitch and YouTube channels? 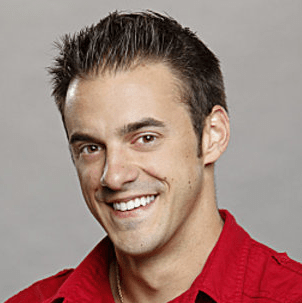 Dan Gheesling: For me, the games I play will always change. I approach YouTube and Twitch is a unique way. I am very strategic about what I do. You look at most popular games in the world such as Fortnite and PUBG (PlayerUnknown’s Battlegrounds) Battle Royale; there is so much attention surrounding those games. I try to play games that a lot of people are not playing, but a lot of people like to watch. I like to call it “The White Space,” there is less competition, and I am very self-aware that people don’t tune in to watch me because I’m the best mechanical or best game player. I believe people tune in because they want to be entertained, maybe walk away a little bit more positive or provide them with some form of escapism. I just try to fill that void where maybe some really good games are not being played and are not necessarily the most popular in the world. Jacob Elyachar: If my readers head to your official YouTube channel, they will notice that a majority of your collaborations star Team Unity. Could you please share Team Unity’s origin story to my readers? Dan Gheesling: I create a majority of the content by myself. However, once a week I will create YouTube videos or livestream with a group called Team Unity, which is the extension of the NLSS (Northernlion Live Super Show). Over time, I met people either through Twitter or Twitch communities or in person at conventions. In 2012, the first person that I subscribed to on Twitch was a guy named Cobalt Streak (whose real name is Michael Nolte). When you subscribe to someone on Twitch, it notifies them, and they see you in the chat. He reached out to me and said: “Hey! I know you from Big Brother.” I became friends with him and got into a game that he played called The Binding of Isaac. I went online to YouTube to watch videos of people that played The Binding of Isaac, which lead me to meet someone named Northernlion (real name is Ryan Letourneau) and someone else named MathasGames (real name is Mike Martin). I met him at a convention, and he set up a duplicitous lunch between Northernlion and me. He told me that “Hey Dan! Northernlion wants to have lunch with you.” Then, he told Northernlion that I wanted to have lunch with him. He set up this meeting, and the rest is history. We hit it off at lunch, and Team Unity sprung from that initial meeting. Jacob Elyachar: You also started venturing into the podcast world with The Dan Gheesling Podcast. What can your fans expect from this podcast? Dan Gheesling: The podcast comes out every Monday and what it is mostly it is my audio diary or journal of a weekly account of what’s going on behind the scenes of my gaming business. I share some of the things that I am doing, what are some of the projects that I am working on, what’s going on in the community, and how I adapt to different things. I also shared how I created one video and it is a video that did pretty well, but it lead to me to sign an international licensing TV deal for them to license some of my gaming content. My podcast is just a weekly account of what’s going on behind the scenes with me. It’s 90 percent about what I’m doing to grow the gaming business and about 10 percent of the stuff that I do such as visiting garage sales or collecting basketball cards. I try to put out this audio journal weekly, so people have an opportunity to escape maybe or listen to something while they are working out and either learn something or just turn their brains off from whatever they are stressed out about at the current minute. Jacob Elyachar: If you had the opportunity to meet with people who want to become Twitch & YouTube content creators, what advice would you share with them? Dan Gheesling: There is a standard piece of advice that I will not give out. The piece of information is that people say: “Just do it, have fun with it, and do not expect it to blow up. Also, do not have any expectations that are going to grow into something.” From my perspective of doing this over five or six years is I would say the exact opposite. I would start and say: “Hey! Where do you want this thing to go? Do you want to do this full time and make it your full-time career?” I would advise them to work backwards from there and figure out: “Okay, how many leads do I need to sustain?” and build it from there. Really, I think the best advice I can give is if it’s something that you cannot live without, then find a way to make it happen and be patient with the process. It’s really taken me six years to even get to the point where you know, I can justify spending a lot of time on it, away from my family because it’s grown into a business, but it did not just happen. If you look at the first gaming-related videos I put on YouTube; they are not very good. It’s not accidental that one six years later are way better. It’s not because anything has changed since I have had a lot of practice and have done and tried so many different things and failed at different things. My advice would be to figure out where you want to end up with it and then map out what you need to do get there. Do not stop because it is a really up and down road. Things are going to happen. Recently, YouTube went on this huge demonetization stretch. Users would upload a video onto the site, and people could not make money off of the ad revenue. A lot of people panicked and left YouTube. Eventually, it got fixed and corrected. Stuff like that is going to happen on every on different platforms including Twitch. But, you just got to put your head down, trust your process, and just enjoy the grind of it. Because, if you do and you genuinely enjoy it, people are going to come to your channel. If that ever changes, then do not do it. I think it is so early on in YouTube and Twitch; there’s a lot of room for opportunities for a lot of people. I think people that may be really into gaming and are hesitant to jump in are going to be regretting not jumping in five to 10 years from now. For more information about Dan, visit his website. You can also connect with him on social media. Visit his Facebook, Instagram, Twitch, Twitter & YouTube channels.